Treetops is the leading Turnkey System Integrator for Renewable Energy Systems and Solar Power in Cape Town. We are specialised in Solar Photovoltaic Systems and the reliable and affordable supply of electricity to homes and businesses. Our Solar Battery and UPS Systems provide uninterrupted solar power on a residential and industrial (several MVA) scale. Treetops provides detailed planning and designs for every client and ensures that all requirements are understood and met. Our clients appreciate the detail and quality of consultation and time invested into their Solar System. We use our strategic partnerships in the energy distribution industry to provide especially engineered solutions for clients with extraordinary needs. With our Photovoltaic Systems we strive to fulfill every need of our customers. When you decide, it is time to become Energy Independent using Solar Power, Treetops Renewable Energy Systems will provide you with the best possible service to give you peace-of-mind about your Renewable Energy System Installation. 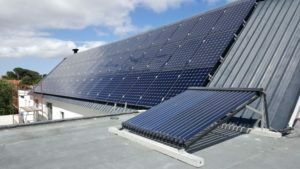 As one of the leading Solar Companies in Cape Town we will tailor your Solar Systems exactly around your requirements. We can stick to your budget, achieve a certain saving per month or assist you going off-grid. Our Solar Power Systems will help you to realise your energy independence. Phone or e-mail to get in touch with us and we will assist you with your Photovoltaic System Installation. Furthermore, we want to give you an opportunity. Discover yourself how much you can save with a Solar System, rather than relying on information. Build your own Solar System and let us work together on your Energy Independence and reducing your electricity bill! 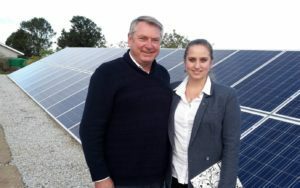 Treetops Renewable Energy Systems is a Solar Company run by a father and daughter team. Martin Pollack has pioneered Solar Power in Cape Town, using his own house as the pilot project, together with Anthony Keen and Ivan Kohler. This resulted in the SSEG regulations for the City of Cape Town Municipality and the possibility to offset your bill with Solar Power. Since 2009 Treetops has grown steadily and installed over 70 Solar Systems in the Western Cape, with more than 4000 Solar Modules, striving to increase this number. Our total installed capacity is over 2.5MWp of Solar Power, supported by more than 1700kWh of Battery Systems. Solar Systems in South Africa are still very young. Especially European countries, the USA and China show, how much potential there is in Solar Power and Photovoltaics. The market for Solar Power in Cape Town is growing since years in these countries and there is no sign it will stop. There are many agendas around the world to make countries more and more environmentally friendly and Solar Power is always a main contributor. This global trend has now finally arrived in South Africa and especially Cape Town is on the forefront of pushing Renewable Energy. Thousands of Solar Systems in Cape Town are producing CO2 free and affordable electricity every day. The City of Cape Town one of the first to release an official Renewable Energy Electricity Tariff and actually credits you for Renewable Electricity that you feed back into the public grid. Photovoltaics will develop into the most important opportunity for Home Owners and Businesses to become independent from their municipality and significantly reduce their electricity bill. Companies greatly benefit from commercial grid-tied Solar Systems, while Residential Houses will gain the most from a Solar Battery System. The Battery will protect them from power failures and provide them with up to 100% Solar Power. We want to invite you to browse through our website and find out more about us, what we do and have done. Solar Power in Cape Town and the Western Cape can do a lot for you and your family. Contact, phone or e-mail us at any time and we will find out together, how you can benefit with a Solar System. Solar Power has become a real alternative to your municipal supply and provides many more benefits than just saving money. You produce electricity yourself! No need for big power lines and transformer stations and no need to burn coal and transport the electricity across the country. It is produced right where it is needed: on your roof for your house. This electricity is incredibly affordable and only once-off investment. Afterwards your Solar System will produce free electricity as long as the sun is shining. Solar Power in Cape Town is also creating work opportunities! Treetops Renewable Energy Systems has trained and employed many people to make YOU more energy independent. With a PV System your cost of electricity is fixed for the next 25+ years. A Solar Battery System is the best opportunity for your home. No more power outages and load-shedding. Use 100% of your Solar Electricity yourself! Have tea and coffee whenever you want and never miss out on a rugby match anymore! You can design your own Battery System on our website! You can design your own Commercial Solar System on our website! Don’t miss the opportunity! Start your Energy Independence and free yourself of Load-Shedding. We look forward to assisting you.